African Minerals Ltd., the largest single industry contributor to Sierra Leone’s GDP and the country’s largest employer, is tonight facing an ever increasingly uncertain future. The company is in a state of financial collapse, despite unconfirmed overtures that Tony Blair is helping the government of Sierra Leone put together a rescue package that could keep the company afloat. Several potential buyers are understood to be currently looking at the assets and market portfolio of the company. But analysts say that the size of it’s debt liability and falling iron ore prices, makes African Minerals an unattractive investment in the short to medium term, especially with the worsening Ebola crisis in the country. On the 24th November 2014, the government of Sierra Leone felt nervous enough as to issue a public statement, casting serious doubts over the financial viability of the country’s largest mining operator. With the government’s 2015 budget depending largely on mining revenue, will the collapse of African Minerals send Sierra Leone’s economy into intensive care? But as yet, no buyer has overtly come forward, though commercially sensitive talks are said to be ongoing, involving potential investors, including the Chinese who currently own a slice of the company. 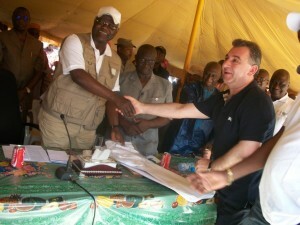 Although African Minerals is said to have invested $2 billion in the country, and employing hundreds of Sierra Leoneans in the northern district of Tonkolili, analysts say that the company has been allowed to get away with paying very little taxes and royalties, in proportion to the massive export revenue it generates from the country’s iron ore. (Photo: President shaking hands with African Minerals’ Frank Timis, marking the signing of a mining deal in 2008). Trading in the company’s shares in London has been suspended for several weeks, as the company falters on its debt repayment, and struggles to raise funding to finance its working capital. Four days prior to the statement by the government of Sierra Leone, the company confirmed there were troubles ahead. On the 20th November, it said that it was struggling to get its Chinese financial backers – Shandong to release much needed working capital. “Trading of the Company’s ordinary shares was suspended at 7:55 a.m. this morning (20 November), pending a further announcement by the Company,” African Minerals announced. But it is now ten days since that statement was published, and nothing has been heard from the Directors of the company. The government’s as well as directors’ pessimism in the face of difficulty in leveraging cash flow funding, has dented investor confidence even further, as the company looks for potential buyers. “In the absence of the release of the restricted cash or availability of alternative sources of funding, in order to address the immediate liquidity issues which the Project currently faces, the Company is seeking to engage with SISG and other parties over a partial disposal of its holding in the Tonkolili mine for a fair market value. Such a disposal may result in release of the restricted cash by SISG and/or allow AML to inject additional funds into the Project, as well as potentially strengthening the Company’s own financial position. “Furthermore, Standard Chartered Bank had been mandated by the Project to structure a new debt facility. Since the announcement on 12 November 2014, due to a further deterioration in market conditions, the Company and Standard Chartered Bank have reached a view that any structuring of a new debt facility is not currently possible. “There can be no certainty that any partial disposal of the Company’s interest in the Tonkolili mine will materialise, and even if concluded, there is no certainty of the timing or financial outcome of such a transaction. The Company’s ordinary shares will remain suspended pending clarification of the Company’s financial position,” says African Minerals. The collapse of African Minerals Ltd will have profound impact on Sierra Leone’s economy, especially the government’s effort to raise revenue to finance its 2015 budget. It is estimated that over $50 million is likely to be wiped out of the government’s budget in the first quarter of 2015, as a result of the closure of African Minerals. Just weeks ago, finance minister Marah announced details of the government’s 2015 Budget, which according to the government is aimed at “restoring livelihoods for post Ebola economic and social Recovery”. 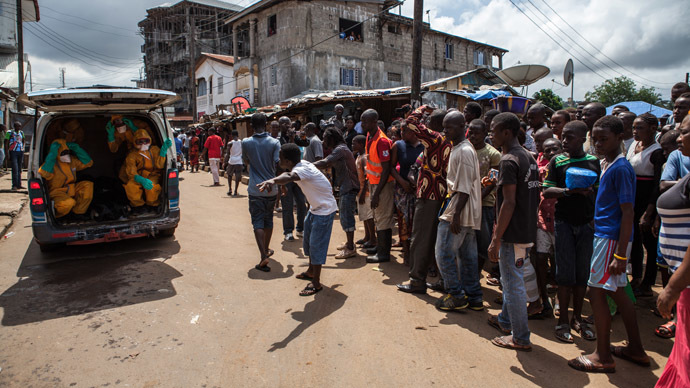 But with Ebola refusing to show signs of a let up any time soon, Sierra Leone’s economic recovery looks bleak, as president Obama calls for the debts of countries affected most by Ebola to be written off. 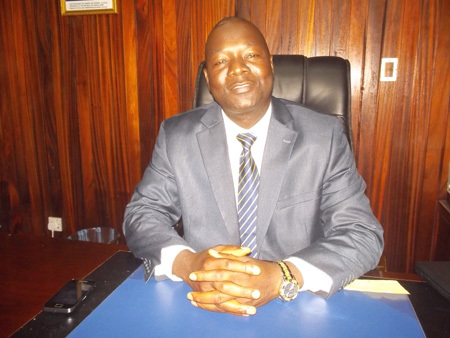 Critics of the Koroma government say that the finance minister ought to have known that all was not well with African Minerals Ltd., when he was preparing his budget and producing his growth forecasts for 2015. Presenting his budget to parliament, minister Marah sounded confident. But his rationale and assumptions for growth could not have been more inaccurate. “Mr. Speaker, Honourable Members, the medium-term macro-fiscal framework agreed with the IMF in April 2014 indicates strong growth, declining inflation and improving external and fiscal performance. This was anchored on the assumption of expansion in iron ore mining, agriculture and services, coupled with the expected recovery in the electricity sector and the planned scaling-up of investment under the Agenda for Prosperity,” Marah told parliament. On the very week finance minister was putting pen to paper, drafting his budget statement, it was obvious that African Minerals was already in deep financial trouble. Was the finance minister unaware of this fact? At the heart of the government’s 2015 Budget, is its promise to put more money into the pockets of hundreds of thousands of public sector workers in the country, which may not now materialise. Analysts believe that the government got its sums wrong, and must now revise its revenue and spending targets for 2015, so as to avoid incurring massive debts and rising inflation, if it chooses to borrow its way out of this financial crisis. 2014 has not been a very good year for the country’s economy and government’s finances, with several public sector workers and contractors unpaid for work and services rendered to the government. “As a consequence of the impact on economic activities, revenue collection dropped and is estimated to decrease by about Le 390 billion, equivalent to US$90 million in 2014 (1.6 percent of non-iron ore GDP),” minister Marah admitted to parliament. The government’s debt service payments are projected to rise to Le347 billion in 2015, with Le228 billion to be paid in interests on domestic and foreign debt, and Le118 billion for principal repayments of loans. With the Ebola crisis overshadowing the country’s current economic predicament, and the World Bank and the IMF underwriting most of government’s current spending, finance minister Marah had considered two likely scenarios, one of which may determine the prospect for the country’s economy in 2015 and beyond. He told parliament that; “If the low Ebola outbreak scenario materializes, an economic recovery will emerge over the course of 2015. Under this scenario, economic activities rebound led by agriculture, manufacturing, tourism and construction. This will result in GDP growth of 2.5 percent in 2015 compared to the 9 percent originally projected. “Under the high Ebola scenario, agricultural output will fall dramatically due to large scale abandonment of farms by farmers and services will also contract, especially in the hospitality sector. Economic buoyancy will largely depend on Government expenditure, which is highly uncertain. In this case, overall GDP will contract by 2.0 percent in 2015, while non-iron ore GDP will shrink by 3.2 percent. Inflation will remain high reaching 14 percent, due to poor harvest in 2014 and loss of planting seasons in 2015. So which of these two Ebola scenarios is the finance minister putting his bet on? But how did the finance minister arrive at the erroneous conclusion that Sierra Leone is enjoying a “low Ebola scenario”, after the virus has taken the lives of more than 1,496 people, with the total number of cumulative confirmed new cases now risen to more than 5,831 – an increase of 390 new cases in just five days? How realistic is the finance minister’s expectation of a low level Ebola scenario, given the exponential rise in the rate of infection and transmission of the virus across the country? Whose interests will a false sense of optimism and misleading economic forecast serve, other than the government’s, whose sole preoccupation since 2007 has been about laundering its image? So how does the finance minister hope to finance his “low Ebola scenario” budget, especially with the massive impact of the closure of African Minerals on the economy? The minister said that under the “low Ebola scenario”, total budgetary requirement in 2015 will amount to Le3.3 trillion Leones”. “Borrowing from the domestic bank and non-bank sector through the sale of Government securities will amount to Le451 billion. Proceeds from the repayment of the Loan from Sierra Rutile will amount to Le51.6 billion. Proceeds from the privatization of state enterprises are estimated at Le17 billion,” the finance minister told parliament. He said that; “Income taxes will contribute Le921 billion; Goods and Services Tax, Le495 billion; Customs and Excise duties, Le520 billion; Mining royalties and licenses, Le 231 billion; and Fisheries licenses and royalties, Le40.1 billion. Revenue collected by other Ministries, Department and Agencies in the form of fees, charges and levies will amount to Le82 billion. Road User Charges and Vehicle licenses will amount to Le100 billion. So how is the minister going to cover the massive financing hole that he has created, as a result of his misleading “best case low Ebola” economic growth projections? This is what he said: “Mr. Speaker, Honourable Members, even under the best case scenario (low Ebola), there is a projected uncovered financing gap of about US$37.2 million or Le161.1 billion to support the allocations I have just announced. In this regard, Government would seek additional external support to close this gap during the course of 2015. So, with the RED rabbit out of the finance minister’s magician hat, what are the risks to the 2015 budget? And how is he going to deal with those risks, notwithstanding the fact that he failed woefully to factor into his budget, what now seems like the imminent closure of African Minerals, with the loss of millions of dollars in revenue to the government? Minister Marah said: “Mr. Speaker, Honourable Members, as indicated earlier, economic prospects for 2015 and beyond are highly uncertain due to the unpredictability of the duration of the Ebola disease and external risks. These risks may impact negatively on budget execution and the performance of the economy. In our case, risks specific to Sierra Leone are described below. “First, the prolonged spread of the Ebola viral disease will further disrupt economic activities; undermine domestic revenue collection; increase Ebola-related expenditures and will divert budgetary resources from other productive activities to fight the epidemic. In such a situation, Government will further scale back the domestic capital budget and re-prioritise discretionary expenditures. Nothing said about mitigating those risks. But what is certain is that Sierra Leone’s economy is fast heading into intensive care once again, since the end of the war in 2001. The international community may now have to dig much deeper onto their coffers this time, if Sierra Leone is to avoid anarchy and chaos, caused by economic collapse and worsening Ebola crisis.